Bridge to Another World: Alice in Shadowland Collector's Edition is a new release to the Bridge to Another World series. It is going to be another trip to another world, where you will play a big role. 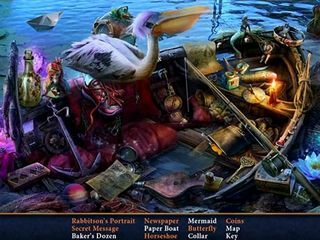 4Friends Games has done a good job with this new hidden object puzzle adventure game. As much as you want to go back to your normal life, you are told that you are the chosen prophet and end up getting involved in the rebellion against the queen. 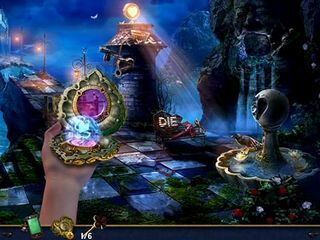 Bridge to Another World: Alice in Shadowland Collector's Edition is a game with an interesting story yet you can not lie - the elements of the story are not new in any way. Kidnapping, an evil queen, a chosen one - doesn't it all sound familiar? It does but this game's story is still fun to follow. As you can guess from the title the game is a twist on the Alice in Wonderland story. This time around Alice is a grown-up and Wonderland is a dark kingdom under the red queen rule. As much as you want to go back to your normal life, you are told that you are the chosen prophet and end up getting involved in the rebellion against the queen. Then there is also a bonus chapter where you travel to the past to stop another evil plot. It is an interesting and engaging story with character development. The game's graphics are dark (hey, we are in Shadowland), but not very sad or scary, mostly blue with all kinds of strange little items or scenes that you would expect in a story about the Alice. The game is offered in four difficulty modes: Casual, Advanced, Expert, and Custom, and adjustable hints (10-180 seconds) and skips (10-320 seconds). 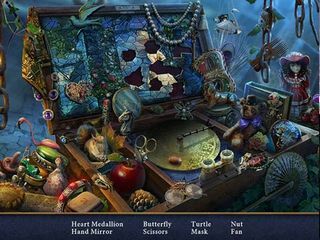 The hidden object scenes and the puzzles are well balanced. Both show quite a lot of creativity even though you get the same usual kinds of both. But they are fun! You get a compass that helps you locate lost items and those, in turn, show some events of the past. You need to pay a lot of attention to the scenes and find 30 morphing objects and 37 collectible cards. In addition to that, you can earn 20 achievements. Don't forget about all the media extras that you get with this collector's edition (wallpaper, soundtrack, concept art etc...)! This is Bridge to Another World: Alice in Shadowland review. Download this game here.